Corn mazes and pumpkin patches are located in rural areas all around Seattle and are popular as harvest season approaches. A journey to the nearest pumpkin patch to pick out pumpkins for jack-o-lanterns, decoration, or making a pie is the perfect October tradition. 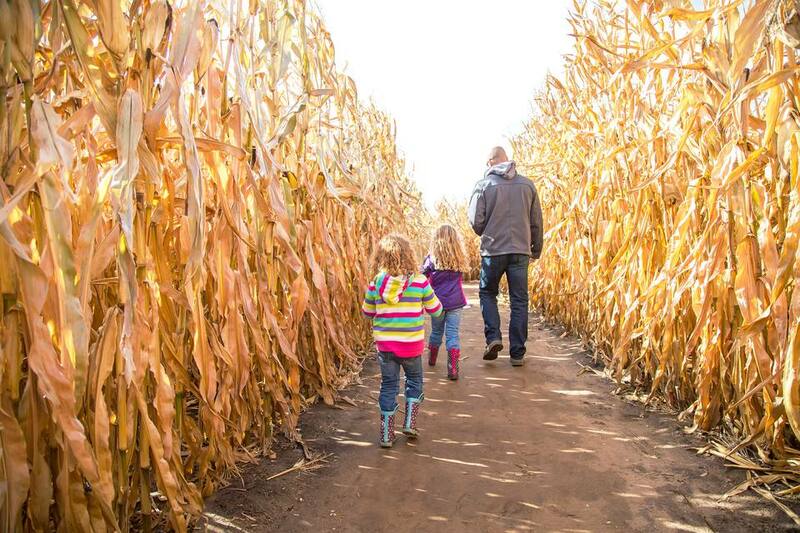 Heading to a corn maze can either be great fun with the kids, or part of your own Halloween scarefest! Corn mazes are sometimes simply mazes through corn fields, complete with clues or surprises hidden in the maze—other mazes are open after dark and filled with frights, strobe lights, and costumed actors. Choose your Halloween adventure at these corn mazes and pumpkin patches near Seattle. Bob’s Corn is open from 10 a.m. to 7 p.m. every day starting in July or August to October. Its 10-acre corn maze opens for business in September, and beyond your everyday daytime corn maze, there are special night maze times on Fridays and Saturdays in October when maze-goers take only flashlights to guide them. The pumpkin patch features more than 15 types of pumpkins and a free hayride to get to the 15-acre pumpkin field. Bob’s Corn always has plenty of family-friendly fun, but in October other special draws include a snack bar, face painting, pony rides, and barbeque. Haunted corn maze: A night maze is open only in October on Fridays and Saturdays, but it's not haunted. Throughout October, Carleton Farm brings out its Halloween spirit with a pumpkin patch, a corn maze, fire pits, and other fall fun. You can pick your own pumpkin in the patch, or buy one that’s already been picked in the barn. The four-acre corn maze has points that you can find on a map and try to solve the puzzle, or just wander through. By night, the maze turns haunted or you can even go through a paintball zombie shoot! Carleton Farm has fresh fruit, vegetables, jams, pies, and even local wine and cheese at its farm market in September and October, too. Carpinito Brothers’ corn maze and pumpkin patch are open from usually late September until Halloween. Other Halloween fun at the farm includes kettle corn, roasted corn on the cob, and hayrides. As a special bonus, this is a dog-friendly pumpkin patch (but no dogs allowed in the corn maze). With 20 acres of pumpkin patch and a 15-acre corn maze, Craven Farm ensures all visitors have lots of room to create some harvest-time memories. By day, the corn maze is a lot of fun, but it's also open at night for a few nights out of the season and remains haunt-free. For younger mazers, the Kids Adventure Maze is sure to be a hit. Other attractions include baby animals, a snack bar, story time tours on weekdays, hayrides, kettle corn, scarecrow making, and more added every year. Along with a pumpkin patch (the largest in the area!) and five-acre corn maze, activities at Double R Farms include a pumpkin sling shot, hayrides, free tractor-pulled hayrides, and storytelling times. The farm prides itself on affordable prices. On weekends in October, Fairbank Animal and Pumpkin Farm is a delightful place to visit. Pick out a pumpkin or two or three, and enjoy the onsite baby animal zoo! Chicks, ducklings, calves, sheep, goats, and more all live at the farm. Everyone who visits gets a free cup of food to feed to the animals. There is a small admission fee. If you've got smaller children who may not love a corn maze, this farm is perfect. You-pick pumpkins and apples are just the start of the Halloween activities at Gordon Skagit Farms. The Crop Circle Corn Maze provides seven acres of circular passages through the corn to navigate. A haunted barn is spooky, but still kid-friendly. There is a largest pumpkin competition, pumpkin carving contest, and a cider shack. Haunted attraction: Yes, but it is kid-friendly. Every Saturday and Sunday in October, Jubilee Farms has hayrides, snacks, a market, and you-pick flowers, farm animals, and a pumpkin patch. While there's no corn maze, there is a hay maze for younger children to explore. The Maris Farms corn maze is a puzzle to solve in the day with clues posted throughout, and the night maze is a flashlight-only and non-haunted adventure. If it’s creeps you seek, check out the Haunted Woods—a journey through a corn field and forest filled with scares. Other activities include hayrides, all-ages jump pillows, a pedal cart track, and pony rides. Picha Farms is known for its berries all through the summer, but it's a pretty awesome fall destination too. Activities include a six-acre corn maze, a pumpkin sling shot, hayrides, and there is plenty of apple cider, kettle corn, and other snacks. Remlinger Farms puts on a Harvest Festival from late September through October each year, complete with you-pick pumpkins, live entertainment for kids, a corn maze, and even rides! Rutledge Corn Maze is all the way down in Tumwater, close to Olympia off of exit 99, but may be worth the drive if you’re a corn maze aficionado. Each year, the maze is cut into a theme. Past themes have included “Deadliest Catch” captains and “Twilight.” By day, the maze features a who-dunit mystery to solve. By night, there is a haunted maze that sometimes follows the theme, as it did with the “Twilight” theme, filled with vampires and werewolves. The farm also has a 3.5-acre you-pick pumpkin patch, hayrides, and a produce stand. Spooner Farms has a pumpkin patch and corn maze, along with many other activities during its annual Harvest Festival. Fire a pumpkin sling shot, feed the farm animals, or enjoy face painting, snacks, caramel popcorn and apples, an activity barn, and more. Stocker Farms goes all out for the month of October. At the main location, pick out your pumpkin from acres of pumpkin fields. Across Highway 9 at 8705 Marsh Road, you’ll find Pumpkin Park, with a trout fishing pool for kids, face painting, a barrel train, pumpkin cannon, an air jumper, duck races, hayrides, and more!